It can feel as good as a "runner's high" and improve mental health - now a campaign has been launched to get more people volunteering to help others. The Royal Voluntary Service is aiming for the largest recruitment drive since World War Two in order to relieve pressure on public services. It said volunteering could reduce stress and boost happiness, with many volunteers saying they are less lonely. 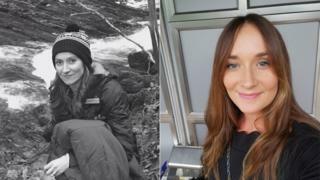 Two women in Wales have told us why they love to volunteer. Image caption Helen Sier said volunteering came at the "right time"
Betty, an 88-year-old former nurse who was born in Hirwaun in Rhondda Cynon Taff, has lived with anxiety and loneliness since the death of her husband. "I don't like being by myself," she said. But her loneliness has been eased by mother-of-three Helen Sier, from Merthyr Tydfil, who started visiting Betty in 2017 twice a week as part of a good neighbours scheme. "She's just a beautiful lady," said Helen. "I'm so glad I've had the chance to work with her and as it's gone on, our friendship has really grown. We've got a really close bond. "I didn't even consider volunteering until about 2016 - I'd become a Christian and that changed my whole perspective of life." Helen cannot work full-time as she has to care for her youngest son, who has autism, but now has more time during the week to help Betty while her son is at school, and said the scheme came "just at the right time". "Every time I go and visit Betty she's so excited and you can see how much of a difference it makes to her. "It's rewarding to know you're making that big of a difference to someone and it's lovely to hear all the stories. "I lost my own nan and grandpa when I was younger so its nice to spend time with an elderly lady and you can just get along because you can talk about anything." Not only do volunteers provide much-needed company for people in need, but sometimes unpaid roles are vital to keeping services moving. "I absolutely love going there," she said. "We meet such wonderful people, the patients have all got such different stories to tell and I absolutely love it. "What I do is teach chair-based exercise classes with people on the rehabilitation ward, so older people to try and increase their strength and balance and reduce their risk of falls. "When you're in hospital it can be very lonely and very boring. The staff are in there doing a wonderful job, but you can provide a bit of time to go in and break up the day for somebody, it's really appreciated. "You see that with the Royal Voluntary Service trolley which goes around. They are selling snacks and toiletries, but a lot of benefits for the patients in hospital is just to see a smiley face every day." Emily admitted working hours could be a stumbling block for many people, but said volunteering could be a flexible activity. "I think that's definitely a barrier to people volunteering but the thing is there are so many different roles out there that you could easily do with one hour a week and it could be flexible. "It's definitely worth reaching out to charities to say 'I have a skill' because everyone has a skill they can offer and with an hour a week, or even an hour a month, that could be valuable to someone."